It has often been said that what you put into your body is reflected on the outside, which is why a healthy diet is crucial to good skin, particularly as we get older. “Prevention is better than cure when it comes to anti-ageing,” says fitness and nutrition expert Alexandra Wilson (www.alexandrawilson.com). “And to do this effectively we need to address our health both internally and externally. 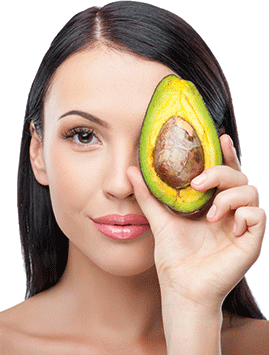 Protecting your skin does not only relate to how you treat it from the outside but how you nourish from the inside too through a healthy lifestyle and wholesome food.” Here are some top foods to eat for radiant skin. TOP TIP For the perfect guacamole mix two avocados with one pressed garlic clove, a quarter of a cup of Turkish yogurt and one tablespoon of lemon juice. Add half a chopped red chili, half a finely chopped yellow onion and one chopped tomato and season with salt and pepper. TOP TIP Use kale or spinach raw in salads or simply add them to your favourite juice or smoothie recipe. Always choose fresh-looking greens and avoid those with brown spots. TOP TIP Make a tasty salad by combining baked butternut squash with some rocket, onions, olives, cranberries and pumpkin seeds and sprinkle some lemon juice over the top. TOP TIP Coat a mackerel fillet in lemon or lime juice, add some crushed garlic or ginger and grill for five minutes on each side. Sprinkle with fresh parsley and serve with rice and veggies. TOP TIP Boiling up a chicken carcass, shells and bones from fish/seafood, or bones from beef or lamb for three hours or more enhances the breakdown and extraction of many nutrients, leaving a nutrient-dense drink that contains easily-absorbable goodness. TOP TIP Mix the kefir with banana or frozen berries for an all-natural ‘frozen yoghurt’. TOP TIP Try sprinkling some hemp protein powder on scrambled eggs, stir-fried vegetables and salads.